FINALLY! 8 Months Later – Electricity! At LONG last, a full 8 months after we first requested electrical service, ConEd is finally installing electric in the building today. And it almost didn’t happen today… Alternate side of the street parking was suspended today. I parked over the critical manhole, but then someone parked in front of me – so the ConEd truck couldn’t be right next to the manhole. Apparently some ConEd crews will refuse to work if the truck can’t be next to the manhole (since things get stolen out of the trucks), but the guys who came today just dealt with it. I’m just SO HAPPY we’re finally getting electricity. Having a generator running all the time is expensive, noisy and fumy. And most importantly, now we can get security up and running (so we can stop sleeping there) and it should help the workers work more quickly. I woke up a little worried this morning. I was expecting 3 condensers and realized only two were installed. We were supposed to have two smaller higher efficiency (18 SEER) units and one big lower efficiency (16 SEER) unit. Turns out Mitsubishi has upgraded the lower efficiency units so they are also 18 SEER now, so we can get away with two of the larger ones. In case you’re not familiar with mini split systems, each of those condensers powers 4 room units. So we’ve basically got a zoned A/C system where each room is a zone. It’s a much simpler system than a forced air system – and more efficient. 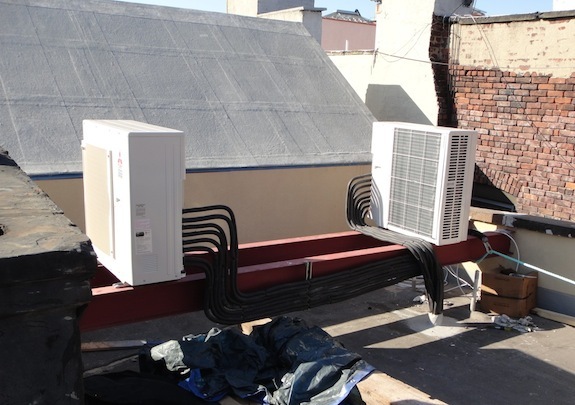 There will be another condenser for the 3 units in the rental apartment – but it will be located in the garden. One rule we won’t be complying with is that A/C condensers have to be 8+ feet from the lot line. Given that we’ve got a 15 foot lot, there’s no feasible way to comply with that rule. Then there’s the matter of FDNY access. They need a ladder up and over the bulkhead. Because the dunnage is a bit high, the ladder will need to extend over the dunnage. Then on top of that they need 6 feet clear. The supply lines for the condensers will probably have to be modified to get a full 6 foot clear. 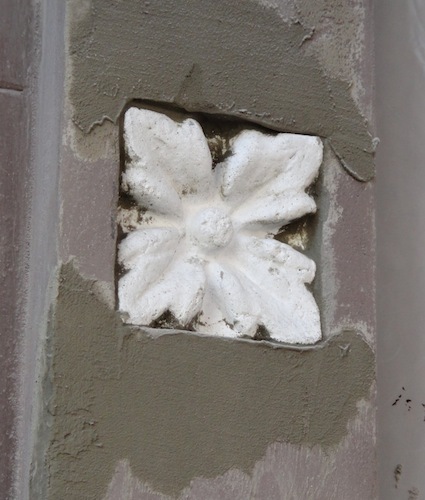 That’s right after they put the recast rosette into the stone. They still need to clean things up a bit (clearly). SEVEN AND A HALF months after first contacting ConEd we are finally getting gas and electric! Yesterday they tore up the street, today they put in gas, and hopefully tomorrow they’ll do electric (rainy days and high voltage electricity don’t mix very well so it couldn’t be done today). Mind you, getting gas and electric into the building doesn’t mean we can use the gas and electric – they still have to set up the meters. Julia Angwin had delays with gas service because her plumber didn’t get the gas lines inspected promptly and ConEd wouldn’t install the meters until the inspections were done. Hopefully we can avoid that problem and have heat before the weather drops below freezing. But the good news is that the big delay is over and hopefully it will be downhill from here on with ConEd – though somehow I think there will be some problem that will crop up – in general, things just don’t go all that smoothly with ConEd. Otherwise, they’re continuing to clean the brick, the woodworker is restoring the door, and the A/C guys are working on their stuff that has to be done before the walls are closed up. Unfortunately, there was one room where the A/C drip drain would have gone into the wall directly over an electrical panel, so that took some thinking to come up with another suitable location. And sometime over the past few days the roofing guy got the primer down on the bulkhead – so that’s closer to being water tight as well. Today was not a good day. The ConEd guy came by and said it could be as much as 3 more months to get gas and electric service. We’ve already waited 5 full months – so that means 8 months to get utility service. That’s absurd. The first five months was because ConEd refused to install their part until DEP had installed the new water main connection. Word to the wise – just flat out lie to ConEd and tell them you’re using the existing water main connection. The water main sub contractor will be under the control of your contractor – just get them to dig carefully. 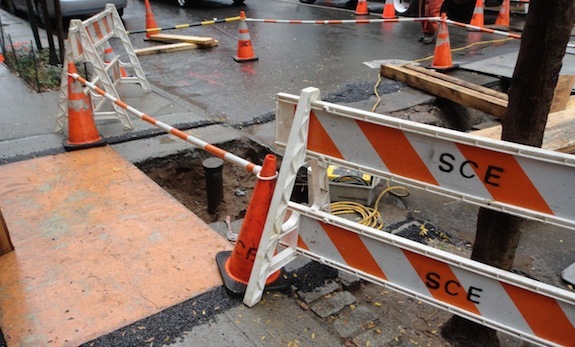 Also, a good idea is to put the new gas and electrical connections as far away from the water main connection as possible – it will minimize the chance that ConEd’s stuff will be disturbed. But the rationale behind the additional 3 month wait is just retarded. 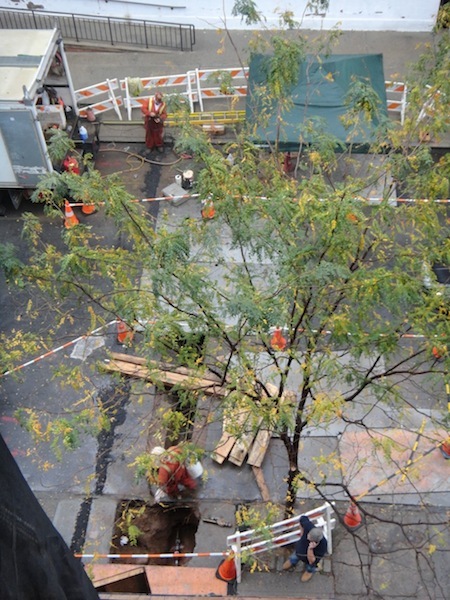 Apparently ConEd only has one contractor working for them who’s got clearance to dig up streets in New York. There’s another contractor lined up but someone is dragging their feet signing the paperwork to get that contractor going. Meanwhile the first contractor has a backlog of 70 to 80 jobs, hence the 3 month wait. 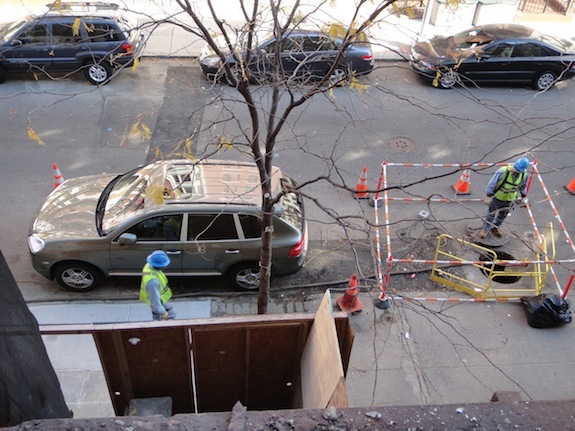 But it gets worse… ConEd’s budget for installing new electrical/gas service is nearly exhausted. There’s no money at ConEd to pay their contractor to do the installations. What properly run business doesn’t have the money to start up new accounts? That just boggles my mind. They have to spend the money sooner or later and the sooner they do the installation the sooner they make money off us. Needless to say, I blew up. 8 months is insane. The ConEd guy said he couldn’t start our 3 month wait because the electrical / plumber hadn’t put in the new sleeves (holes in the wall). So I was all over the electrician asking why they weren’t done yet. He said they weren’t done because he said ConEd said they wanted to wait for the water connection to be done. So I pushed further – why not just put them in anywhere (they could always be redone)? Then the electrician and the ConEd guy both tried to say they had to wait to see where the water connection came through the wall. I wasn’t having that excuse – the water connection came through EXACTLY where it had been before. Nothing changed. Then I was all over the ConEd guy – if he knew it was a 3 month process why didn’t he say something to that effect earlier? Why not get us into the queue months ago? Why do we have to wait 5 months to start on a 3 month wait? If he had put us into the queue at 2 months we would be at the top of the queue now and everything would be fine. After waiting for 5 months we shouldn’t be told we have to go to the back of the queue. When it was clear the ConEd guy was at fault, he said he needed to go to another appointment and he just turned and left. Nice. He causes us major problems and can’t even say ‘sorry’. I should stop and say that as much as I rag on the bureaucracy at City agencies, our experience with DEP to get the new water connection was nearly flawless by comparison. Despite a hurricane doing a direct hit on the City, DEP managed to get us a water connection two weeks and two days after we got final signoff from DOB. Kudos to DEP! The only silver lining to all of this is that the additional 3 month wait won’t hold anything else up. The electrical and gas inspections can be done without electrical or gas service. So we can close up the walls, etc. Still, it’s a bit insane that we won’t get electrical and gas service until right before we move into the building. Pretty much the entire job will be done off generators. Hopefully there won’t be freezing weather before we get gas and electric, since we’ll need those for heat to stop the pipes from freezing. Update #1 (that night): I’ve filed a complaint with the New York State Public Service Commission Office of Consumer Services. They have a handy online form you can use to make complaints against utility companies. We’ll see if it helps. Update #2 (the next morning): Dan called the guy’s boss and left a message and then the boss called back a half hour or so later and said he had talked to the guy several times about us this morning. I think after I blew up yesterday the guy realized he had to do something. They’re now on top of things and are going to make sure there are no delays. The boss reiterated what I had been told that 3 months is a worst case scenario, but he didn’t say what the average wait time is. If it’s 2+ months then it’s still the same problem. We don’t know whether he’s aware yet of my complaint to the public service commission. But our strategy at this point is to be a very squeaky wheel that can’t be ignored. Apparently ConEd had told our contractor that they wanted to put the meters on the outside of the building so they could be easily read. Our contractor didn’t bring the issue up with us and ConEd only made a passing comment to me at one point. When it really sunk in that they were putting the electrical meters on the front of the building we got a bit upset. 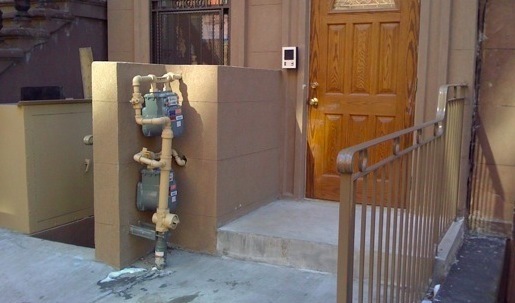 I mean gas and electric meters on the front of a townhouse can be incredibly ugly (see pic below). I talked it over with Dan and with our architect and we decided to be firm that the meters must go in the cellar, as per plans. Luckily we now have documentation that the National Park Service considers our building historically significant, so we were able to simply refuse on the basis that visible meters would alter the historic character of the building. At least ConEd understands that historic preservation trumps their needs/desires. The really ridiculous part is that the technology exists to remotely read meters, but apparently it’s not being used because of the strength of the meter readers’ union.